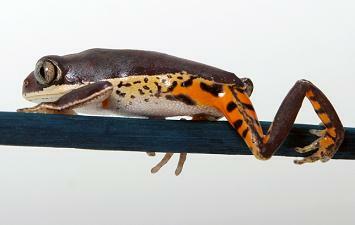 This little frog is quite adaptable, at home in tropical and subtropical rain forest, marshes, & flooded grassland. They are often found in prairie-like habitat that is sparse with trees, but does contain grasses and bromeliads. In Bolivia they have been found in urban areas and gardens. There are two subspecies of Phyllomedusa hypochondrialis, depending on who you listen to: a northern subspecies (the nominate form), P. h. hypochondrialis, and a southern subspecies, P. h. azurea (Cope, 1862). Most, however, consider the southern (P. azurea) to be a distinct species. Like other Phyllomedusine frogs, Phyllomedusa hypochondrialis lays it's eggs on leaves that over-hang bodies of water. Unlike its cousin the Red-Eyed Tree Frog, Agalychnis callidryas, it will form a funnel around its eggs by rolling the leaf that they were laid on around them. The leaf or leaves are held together by a residue that is a product of the egg laying process. This leaf funnel will keep the eggs out of sight of predators and help prevent desiccation. In a week or two the eggs begin to hatch and the tadpoles escape the funnel through its lower opening. Frogs of the genus Phyllomedusa are known as monkey frogs, because as they climb from branch to branch, they reach out grasping the branches the same way as a monkey. Their first and second digits are shifted, so as to allow them to be opposable (like your thumb and forefinger). All frogs of the genus Phyllomedusa produce a waxy substance with which they coat their skin. This prevents desiccation and allows the frog to venture further away from water and to live in more arid environments than a lot of other frogs. The substance may also have properties that protect the frog from the harmful rays of the sun. The Tiger-Legged Monkey Frog is somewhat common in herpetoculture. 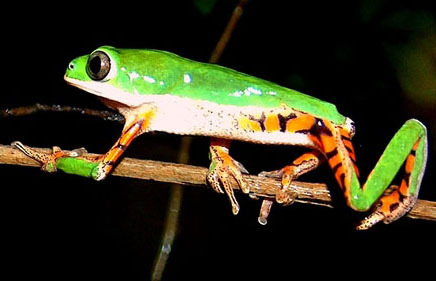 Its husbandry is similar to that of other treefrogs, such as White's Dumpy Tree Frog, Litoria caerulea, and the Red-Eyed Tree Frog, Agalychnis callidryas. Most specimens are wild caught in Surinam. 1. Fenolio, Danté. Captive Reproduction of the Orange-legged Monkey Frog (Phyllomedusa hypochondrialis), and Development of a Protocol for Phyllomedusine Frog Reproduction in the Laboratory. 1996, 13-21. in: Strimple, P.D. Advances in Herpetoculture. Spec. Publ., Int. Herp. Symp. 1996, 1: 1-167. 2. Walls, Jerry G. The Guide to Owning American Treefrogs 1997; TFH Publications. 3. Walls, Jerry G. Red-Eyes and other Leaf-frogs 1996; TFH Publications. I plan on getting one this year, Can you keep this and the Super tiger legged monkey frog together? Not really. I keep getting which is which mixed up, but one requires relatively dry conditions and the other requires high humidity. Thank you for the article! Always love learning about new species and entertaining the idea of someday keeping one!